SMEs represent 99% of all entrepreneurs, provide approximately 70% of all jobs and create around 80% of all new jobs. The further development of SMEs is severely limited by a large, growing shortage of entrepreneurs, managers and skilled workforce. By 2030, the number of younger workers will decrease by as much as 25% in most member states. In addition to the quantitative problems, there are increasingly qualitative bottlenecks due to increasing, dynamically changing qualification requirements. In Germany, the dual vocational training proved itself to be of high value. In the participating countries Poland, Lithuania, Latvia and Estonia, vocational training takes mostly place with complementary internships in companies. The participation in vocational training is very low, the qualifications achieved are insufficient and the unemployment rate is very high. Particularly in these countries with a predominantly school-based vocational training, the relevant skills and competencies must be significantly improved and high-quality quality must be achieved. According to a survey 96% of companies in Lithuania demand better practical and 74% better theoretical skills and abilities. In all the countries participating project countries, the participation in further training as well as the skills and competences conveyed therewith must strongly improve. According to EU’s objectives, at least 15% of adults should participate in lifelong learning each year. This ratio was significantly exceeded by up to 29% in Scandinavian countries in 2016, compared with only 3.7% (PL) to 8.4% (DE) in the project countries. While there are solid vocational and inter-company training capacities in Germany, there is inadequate capacity in vocational education and training in the other participating countries. Vocational schools and companies have no or little experience with dual vocational training, as well as with inter-company training or work-based learning. Against this backdrop, the project pursues the ambitious objectives of further developing future vocational training systems, improving qualifications, enhancing the attractiveness of vocational education and training, and reducing the growing deficits of qualified skilled workers. The project is carried out by 7 partners from Germany, Poland, Lithuania, Latvia and Estonia. The internationally active Lead Partner is particularly experienced in the training and support of SMEs as well as in the implementation of complex educational projects. Partners are three experienced vocational training centers and three chambers, which are responsible for vocational training and operate own inter-company training centers. Project management and implementation of 6 workshops and 2 international multipler Events. Development, establishment and operation of an industry-specific competence center with the realization of a dual vocational training in a country with previously school education and preparation for implementations in two other countries. Development and implementation of further training for vocational school teachers, for the implementation of dual training as well as training of instructors for a technician training. 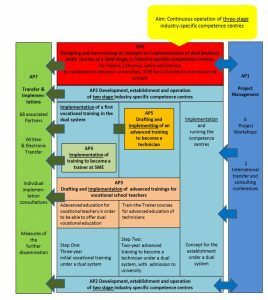 Adaptation and implementation of training for trainers in SMEs in countries with mainly vocational training to create supervisors for the training on the spot. Development and implementation of a further training as a technician within the framework of a dual training of two years with the possibility to allow for a following study course at vocational colleges/polytechnics. Development and coordination of concepts for the realization of dual bachelor courses, combining a dual vocational training with a Bologna-compliant study course, as well as realization plans for the expansion of the two-stage industry-specific competence centres into a three-level system of vocational education (training, further education, study). Transfer of the project results to 68 chambers and universities from 13 countries, which are involved as associated project partners in the project implementation and receive sustainable implementation advice, as well as implementation of further dissemination activities. printed, comprehensive manual with wide high sustainable use is ensured by a process-oriented expansion of the implementation regions, including a sustainable financing.